UK ▼ 2010-10-07 £5.99 ? US ▼ 2010-10-13 1,200pts ? (Trial Game) 2010-10-13 FREE ? UK ▼ 2010-10-13 pts ? EU ▼ 2010-10-13 pts ? DE ▼ 2010-10-13 pts ? AU ▼ 2010 pts ? JP ▼ 2010-10-13 1,200pts ? KR ▼ 2010 pts ? (Pyeong-gapan Game) 2010-10-13 FREE ? JP ▼ 2012-05-15 ¥350 ? US ▼ 2012-01-25 $3.99 ? EU ▼ 2012-01-25 €2.99 ? DE ▼ 2012-01-25 €2.99 ? UK ▼ 2012-01-25 £2.56 ? AU ▼ 2012-01-25 $4.49 ? 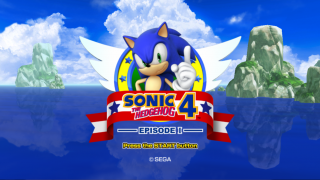 Sonic the Hedgehog 4 Episode I (ソニック・ザ・ヘッジホッグ4 エピソードI) is the first part of the episodic game Sonic the Hedgehog 4. It was released in October 2010 as a digital download on Wii, PlayStation 3, Xbox 360 and iOS. Versions for Windows Phone 7, Steam and Android were also released over the following two years. Episode I was first announced on the GameSpot website on 9 September 2009, the 10th anniversary of the Sega Dreamcast. Sonic the Hedgehog 4 Episode I is set shortly after the events of Sonic 3 & Knuckles and takes place before the events of the next part, named "Episode 2". After Sonic manages to destroy Doctor Eggman's space station, he decides it is time to take a much deserved break. After parting with his companions Tails and Knuckles, Sonic sets off to explore new territories alone. However, unbeknownst to him, his nemesis, Dr. Eggman, has survived their last encounter, and has revisited and improved some of his very best robotic creations in another attempt to defeat Sonic. Sonic must travel through a variety of zones to defeat Dr. Eggman once again. The first episode sees Sonic travelling through four main zones: Splash Hill, Casino Street, Lost Labyrinth and Mad Gear, where he battles Dr. Eggman and altered versions of his past contraptions. Upon handling Dr. Eggman's four initial mechanisms, Sonic then squares off against the doctor in a boss battle marathon. If the game is finished with all seven Chaos Emeralds collected, a post-credits cutscene is shown, teasing the appearance of Metal Sonic in the next episode. Sonic the Hedgehog 4 Episode I has been criticized for its "floaty" physics, likely due to its use of the Sonic Rush engine. This can often result in various oddities such as Sonic being able to stand sideways on walls. Another major criticism is Sonic uncurling when he flies off an edge, thus leaving him susceptible to enemy attacks. Following negative reception from older builds, it was confirmed that the physics would be tuned up for the final release, however it has been stated that dramatic changes in the way the game plays would require extensive level-redesign, which was not possible in the time limit set until the game's release. The music has also been criticized for its poor choice of synthesized instruments, as well as low-quality DAC recordings from Sonic 2 that vary little between songs. Jun Senoue said that he looked into using a Mega Drive soundfont, but could not find a NEC PC-88 (a popular 80s Japanese computer with similar sound hardware) to run the software on. In order to fit within WiiWare size limits, music in the Wii version uses a sequenced format similar to MIDI or module formats. As a result, there are noticeable differences from the Xbox 360 and PlayStation 3 versions' recorded music. In addition, the Wii version only supports a maximum resolution of 640x480 due to hardware restrictions. The iOS/Android version contains some differences found in the PartnerNET build, and retains some changes found in that build, including the rotating minecart stage in Lost Labyrinth Zone and the Score Attack section in Casino Street Zone. The camera rotates when running through loops in this version also. In addition, the music does not loop properly. The 360 version is noticeably shinier than its counterparts, due to higher bloom. The PS3 version doesn't use as much bloom and the iPad version alters some textures, making them less shiny as well. Only the PlayStation 3 and Xbox 360 versions support custom soundtracks. Sega America Blog: Project Needlemouse Character Countdown – Finale and Concept Art! This page was last edited on 13 April 2019, at 14:21.